Move over people, the champ is here. 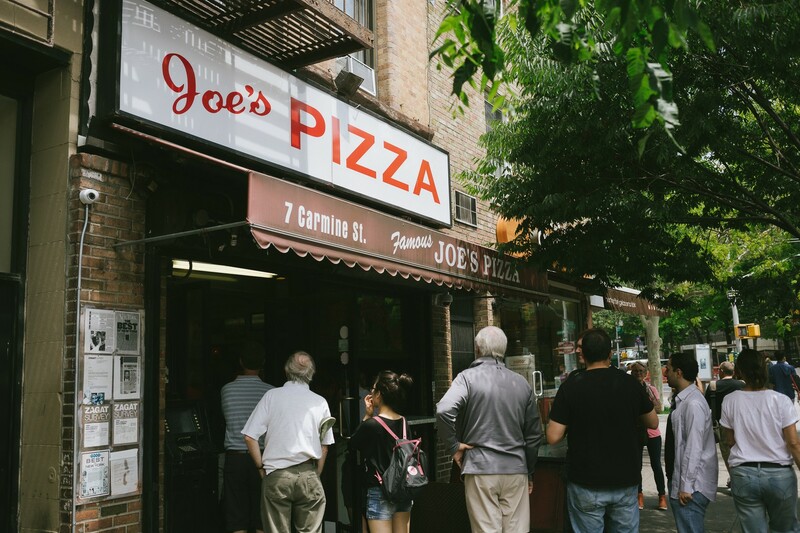 Joe’s is the best slice in Manhattan. It’s been like that forever and will remain that way for eternity. If you can make a case for any other slice on the island of Manhattan, please let us know. Then again, you can’t, so don’t bother. The menu is simple - usually there are three options: plain, fresh mozzarella, and Sicilian (sometimes you can catch a pepperoni pie, too). If you’re ordering by the pie, then there’s the additional toppings option, but why mess with perfection? The kitchen operation is a well-oiled machine and keeps hot pies blazing out of the oven one after the other. Unlike a place like Artichoke, which makes lining up to vote look like fun, the line at Joe’s is the epitome of efficiency. You can be backed up 15 deep on the sidewalk and still be in and out with your slices in 10 minutes, easy. Bonus points to Joe’s for owning one of the best fountain cokes around, with just the right balance of syrup, carbonation, and water. Joe’s isn’t “famous” for their coal burning oven or fresh, imported ingredients. They’re famous for their no-frills, crave-worthy slices. What’s the most prolific of the bunch? That would be their plain slice. As with all their pizza, the crust is thin and chewy with a nice crisp outside. We could easily eat a whole pie in one sitting. Addiction is real. Our standard two slices and a soda order from Joe’s will always include a fresh mozz if it’s available. It’s a sweet tasting slice, and it possesses the perfect cheese to tomato ratio. Joe’s Sicilian is classic. Traditional thick Italian bread overflowing with cheese and tomato sauce, this monster looks just as good as it tastes. It’s not better than either the plain or the fresh mozzarella, but if you’re in the mood for something more substantial, this slice hits the spot.